AUD 2,293 Excl. Duties / Taxes. This Baguette diamond is 0.51 carat in weight, and comes with Very Good polish and Very Good symmetry, as verified from an independent gemological laboratory. The diamond is graded H in colour, and has a clarity grade of IF. The diamond's IGI grading report number is 296728236, which will detail further its specifications and measurements, and will also come with the purchase of the stone. AUD 22,425 Excl. Duties / Taxes. This Trapezoid diamond is 2 carat in weight, and comes with Excellent polish and Very Good symmetry, as verified from an independent gemological laboratory. The diamond is graded H in colour, and has a clarity grade of VVS2. The diamond's GIA grading report number is 6312463329, which will detail further its specifications and measurements, and will also come with the purchase of the stone. AUD 1,661 Excl. Duties / Taxes. This Square diamond is 0.53 carat in weight, and comes with Good polish and Very Good symmetry, as verified from an independent gemological laboratory. The diamond is graded H in colour, and has a clarity grade of VS2. The diamond's GIA grading report number is 1152605024, which will detail further its specifications and measurements, and will also come with the purchase of the stone. AUD 3,847 Excl. Duties / Taxes. This Shield diamond is 0.7 carat in weight, and comes with Very Good polish and Very Good symmetry, as verified from an independent gemological laboratory. The diamond is graded H in colour, and has a clarity grade of VS2. The diamond's GIA grading report number is 5101536810, which will detail further its specifications and measurements, and will also come with the purchase of the stone. AUD 4,441 Excl. Duties / Taxes. 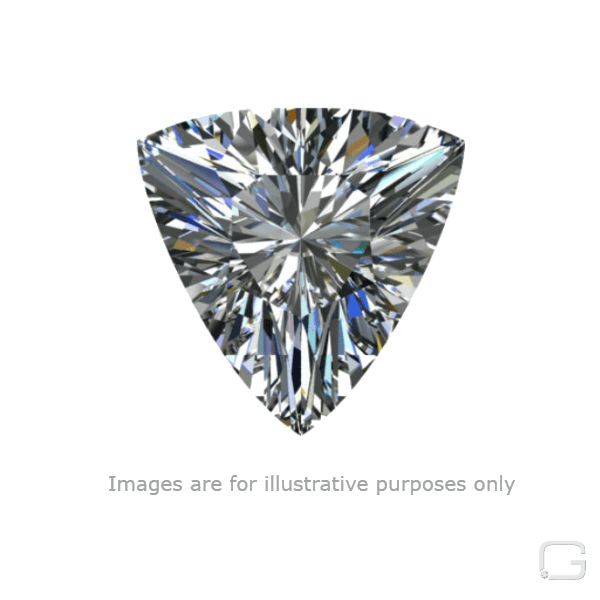 This Trilliant diamond is 0.91 carat in weight, and comes with Good polish and Good symmetry, as verified from an independent gemological laboratory. The diamond is graded H in colour, and has a clarity grade of VS2. The diamond's IGI grading report number is 310844116, which will detail further its specifications and measurements, and will also come with the purchase of the stone. AUD 6,793 Excl. Duties / Taxes. This Triangular diamond is 1.22 carat in weight, and comes with Very Good polish and Very Good symmetry, as verified from an independent gemological laboratory. The diamond is graded H in colour, and has a clarity grade of SI1. The diamond's GIA grading report number is 2216665632, which will detail further its specifications and measurements, and will also come with the purchase of the stone. This Baguette diamond is 1.01 carat in weight, and comes with Excellent polish and Very Good symmetry, as verified from an independent gemological laboratory. The diamond is graded H in colour, and has a clarity grade of VS2. The diamond's GIA grading report number is 5172119264, which will detail further its specifications and measurements, and will also come with the purchase of the stone. This Trilliant diamond is 1.35 carat in weight, and comes with Good polish and Good symmetry, as verified from an independent gemological laboratory. The diamond is graded H in colour, and has a clarity grade of SI1. The diamond's GIA grading report number is 5192848619, which will detail further its specifications and measurements, and will also come with the purchase of the stone. AUD 1,108 Excl. Duties / Taxes. This Triangular diamond is 0.34 carat in weight, and comes with Very Good polish and Good symmetry, as verified from an independent gemological laboratory. The diamond is graded H in colour, and has a clarity grade of VS2. The diamond's GIA grading report number is 2151252604, which will detail further its specifications and measurements, and will also come with the purchase of the stone. AUD 56,191 Excl. Duties / Taxes. This Kite diamond is 3.04 carat in weight, and comes with Very Good polish and Good symmetry, as verified from an independent gemological laboratory. The diamond is graded H in colour, and has a clarity grade of SI2. The diamond's GIA grading report number is 2306912523, which will detail further its specifications and measurements, and will also come with the purchase of the stone. AUD 4,819 Excl. Duties / Taxes. This Trilliant diamond is 1.09 carat in weight, and comes with Good polish and Very Good symmetry, as verified from an independent gemological laboratory. The diamond is graded H in colour, and has a clarity grade of VS2. The diamond's IGI grading report number is 296728191, which will detail further its specifications and measurements, and will also come with the purchase of the stone. AUD 3,384 Excl. Duties / Taxes. This Trilliant diamond is 0.88 carat in weight, and comes with Excellent polish and Very Good symmetry, as verified from an independent gemological laboratory. The diamond is graded H in colour, and has a clarity grade of VS1. The diamond's HRD grading report number is 180000023572, which will detail further its specifications and measurements, and will also come with the purchase of the stone. This Baguette diamond is 0.47 carat in weight, and comes with Very Good polish and Very Good symmetry, as verified from an independent gemological laboratory. The diamond is graded H in colour, and has a clarity grade of VVS2. The diamond's IGI grading report number is 296728234, which will detail further its specifications and measurements, and will also come with the purchase of the stone. AUD 6,035 Excl. Duties / Taxes. This Trilliant diamond is 1.06 carat in weight, and comes with Very Good polish and Very Good symmetry, as verified from an independent gemological laboratory. The diamond is graded H in colour, and has a clarity grade of VVS2. The diamond's HRD grading report number is 180000023573, which will detail further its specifications and measurements, and will also come with the purchase of the stone. AUD 5,897 Excl. Duties / Taxes. This Baguette diamond is 1.01 carat in weight, and comes with Excellent polish and Excellent symmetry, as verified from an independent gemological laboratory. The diamond is graded H in colour, and has a clarity grade of VS2. The diamond's GIA grading report number is 6302484480, which will detail further its specifications and measurements, and will also come with the purchase of the stone. AUD 8,918 Excl. Duties / Taxes. This Trilliant diamond is 1.5 carat in weight, and comes with Good polish and Very Good symmetry, as verified from an independent gemological laboratory. The diamond is graded H in colour, and has a clarity grade of SI2. The diamond's IGI grading report number is S3F96916, which will detail further its specifications and measurements, and will also come with the purchase of the stone. AUD 2,799 Excl. Duties / Taxes. This Trilliant diamond is 0.81 carat in weight, and comes with Good polish and Very Good symmetry, as verified from an independent gemological laboratory. The diamond is graded H in colour, and has a clarity grade of SI2. The diamond's GIA grading report number is 2165567554, which will detail further its specifications and measurements, and will also come with the purchase of the stone. AUD 19,605 Excl. Duties / Taxes. This Trilliant diamond is 2.18 carat in weight, and comes with Very Good polish and Excellent symmetry, as verified from an independent gemological laboratory. The diamond is graded H in colour, and has a clarity grade of VS2. The diamond's HRD grading report number is 180000023554, which will detail further its specifications and measurements, and will also come with the purchase of the stone. AUD 9,803 Excl. Duties / Taxes. This Triangular diamond is 1.13 carat in weight, and comes with Very Good polish and Good symmetry, as verified from an independent gemological laboratory. The diamond is graded H in colour, and has a clarity grade of VS2. The diamond's HRD grading report number is 12013330010, which will detail further its specifications and measurements, and will also come with the purchase of the stone. This Trapezoid diamond is 1 carat in weight, and comes with Excellent polish and Very Good symmetry, as verified from an independent gemological laboratory. The diamond is graded H in colour, and has a clarity grade of IF. The diamond's GIA grading report number is 6325492713, which will detail further its specifications and measurements, and will also come with the purchase of the stone.